Under 287(g) task force models, officers deputized under 287(g) could conduct immigration patrols, and many used this authority to set up checkpoints in communities. Immigrants make substantial contributions to their communities. Why are those contributions being put in jeopardy? Communities should consider the impact of local police deciding to work with immigration enforcement. Participation in 287(g) agreements could have severe consequences for communities considering the program. Immigrants make substantial economic and fiscal contributions and are a part of the social fabric in jurisdictions with 287(g) agreements. The goal of this report is to provide data on the contributions that immigrants, including unauthorized immigrants, make to localities with 287(g) agreements, contributions that could be in jeopardy because of these agreements. Unauthorized immigrants are long-time residents in communities across the country and are inextricably linked to other community members, including their children, their neighbors, and their employers. As individuals, they own and operate businesses that are vital to their communities; they infuse the economy with spending; and they generate tax revenue. All of these benefits that would disappear if they were to leave the places they call home—either because they are deported or choose to do so due to a hostile environment.3 As additional local officials look at the possibility of signing new 287(g) agreements, this research should help inform those decisions as well as make clear what is at stake for communities already embroiled in the program. The data in this report are presented in two sections. The first section includes core demographic information on the foreign-born residents of jurisdictions with 287(g) agreements—number of immigrants, both overall and unauthorized; how long they have lived in the United States; and estimates of mixed-status families (those with family members holding different legal status.) The report’s second section quantifies the economic and fiscal contributions of immigrants who live and work in jurisdictions with 287(g) agreements, calculating their rates of business ownership and fiscal contributions in the form of tax revenue and spending power. The terms foreign born and immigrants are used interchangeably throughout the report. All data presented are from the U.S. Bureau of the Census’ American Community Survey (ACS). The 2011-15 five-year ACS is used to provide a population overview of all 57 cities and counties with 287(g) agreements, while three years (2012, 2013, and 2014) of pooled ACS microdata are used more for detailed cross-tabulations. Due to geographic limitations, this more detailed data is only presented for 40 of the jurisdictions with 287(g) agreements. Additionally, data for Arizona and Massachusetts, the two states with 287(g) agreements that cover the entirety of both states, is not presented. Measures are presented for both all immigrants and unauthorized immigrants specifically. Historically, there were three types of 287(g) agreements: jail models, task force models, and hybrid models. 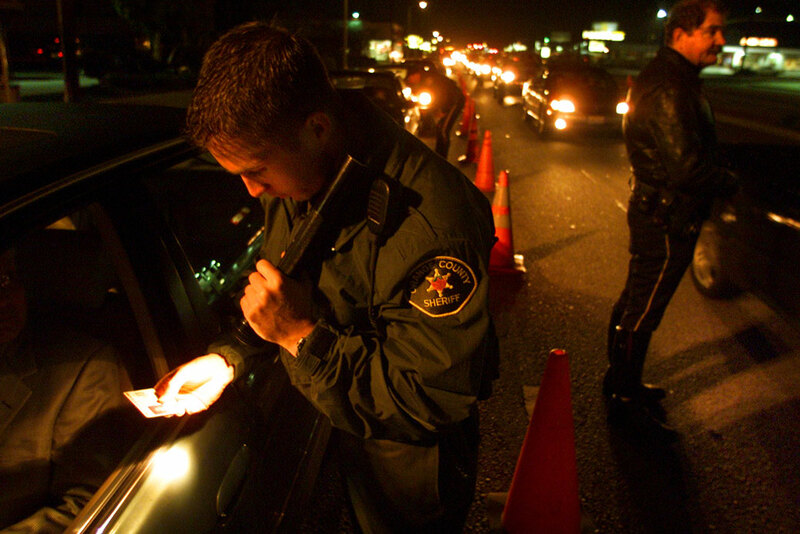 Under the jail model, local law enforcement officers could perform immigration duties for individuals booked into jails. Under the task force model, officers could perform enforcement duties in the community at any time. As the name suggests, hybrid models included both types.9 Task force and hybrid models were discontinued in 2012, leaving only jail model agreements. Author’s note: All data in this section are author calculations based on U.S. Bureau of the Census data. They are all available in Appendix Table 1, where they are sourced. Jurisdictions with 287(g) agreements range widely in terms of their demographics—they are scattered across the nation; are found in places urban and rural; and have immigrant communities both large and small. For the most part, 287(g) jurisdictions are largely located in the Southeast United States as well as in Texas. These jurisdictions range greatly in terms of the size of their immigrant communities. Tarrant County, Texas, for example, ranks as the largest jurisdiction, with more than 1.9 million residents, 302,000 of whom were born in another country. At the other end of the spectrum, four counties in Texas—Goliad, Refugio, DeWitt, and Jackson Counties—each have fewer than 1,000 foreign-born residents. Approximately 6 percent of immigrants in the United States live in the 57 cities and counties with 287(g) agreements, 10 percent when you include Arizona and Massachusetts, the two states with state-wide 287(g) agreements. Just as the size of the immigrant community varies in jurisdictions with 287(g) agreements, so too does the share of the population that is foreign-born—ranging from 2 percent in Goliad County, Texas, to 42 percent in Hudson County, New Jersey. Most jurisdictions that enroll in 287(g) agreements—45 of 57—have smaller concentrations of immigrants than the U.S. average. Conversely, traditional immigrant-receiving communities, or those with large shares of foreign-born residents, do not have 287(g) agreements in place. The general theory is that these communities have a longer history with immigrants and tend to be more comfortable with their presence. On March 2, 2018, Hudson County, New Jersey, terminated their 287(g) agreement. In a county where more than 40 percent of residents are foreign-born, advocacy groups on the ground had long fought back against the agreement.34 The county executive cited state bail reform as the reason for the change, but one freeholder—the term for county elected officials in New Jersey—specifically mentioned the Trump administration’s position on immigrants as a contributing factor.35 Home to nearly 75,000 unauthorized immigrants, 19 percent of the county’s population lives in mixed-status families. Immigrants own 3,800 businesses, generate $8 billion in spending power, and contribute $3.3 billion to federal, state, and local taxes each year. At the time of data analysis, Hudson County had a signed 287(g) agreement. Throughout the report, data is presented for the jurisdiction. At its peak in 2012, 10 percent of the nation’s immigrants lived in cities and counties with 287(g) agreements, 27 percent when including states with 287(g) agreements.36 With the end of task force and hybrid 287(g) models, that share declined substantially. While the number of 287(g) agreements is multiplying under the Trump administration, the expansion is happening in less populous places, both in terms of overall population and immigrant populations. According to the 2015 five-year ACS, 38 percent of people in the United States are non-Hispanic white. Looking at 287(g) communities more broadly, slightly more than half of these communities have populations that are more diverse than the United States as whole and slightly less than half have populations that are less diverse. Data on unauthorized immigrants is available for 40 jurisdictions with 287(g) agreements.37 All but one (Clay County, Florida) of these locales have unauthorized immigrant populations larger than 1,000 individuals. In the United States, unauthorized immigrants make up 3.4 percent of the U.S. total population. Jurisdictions with 287(g) agreements in Southeastern states, such as Georgia, North Carolina, and South Carolina, as well as Texas, tend to have higher shares of immigrants who lack legal status. Jurisdictions in Northern states, such as Massachusetts, New Jersey, and Maryland, tend to have lower shares of unauthorized immigrants, as does Florida. Places with above average shares of immigrants also had above average shares of unauthorized immigrants, while the picture was mixed for places with smaller than average shares of foreign-born residents. Immigrants have longer histories in places with 287(g) agreements than one might anticipate. The median length of time an immigrant has been in the United States based on the data set used for this report is 17 years; 11 years for unauthorized immigrants. In all 40 of the 287(g) jurisdictions, more than half of the foreign-born community has been in the United States for 15 years or more. Not one of the jurisdictions has an immigrant population with a median length of residency less than 10 years. When looking at unauthorized immigrants specifically, it is striking how long these community members have lived in the United States: 60 percent for more than 10 years. Only one jurisdiction—Clay County, Florida—has a median number of years in the United States less than five years. These findings certainly challenge the notion that unauthorized immigrants do not have long-term histories with their respective communities and, in turn, suggests that these agreements affect people with deep ties in these jurisdictions.40 In many 287(g) jurisdictions, the median length of time immigrants have lived there mirror the overall U.S. stats. First, why are new, relatively small jurisdictions signing up for 287(g) agreements? Second, given that they are targeting groups of individuals who have been a part of the community for more than a decade, why do places continue to re-enroll in 287(g)? Beyond the length of time they have lived in the United States, a stronger measure of unauthorized immigrants’ ties to their communities can be seen in their mixed-status families. Across the United States, more than 10.8 million people live in the same household as an unauthorized family member, representing 4 percent of all households. Approximately 6.2 million young people under the age of 18, representing 8 percent of all youth, live in mixed-status families. 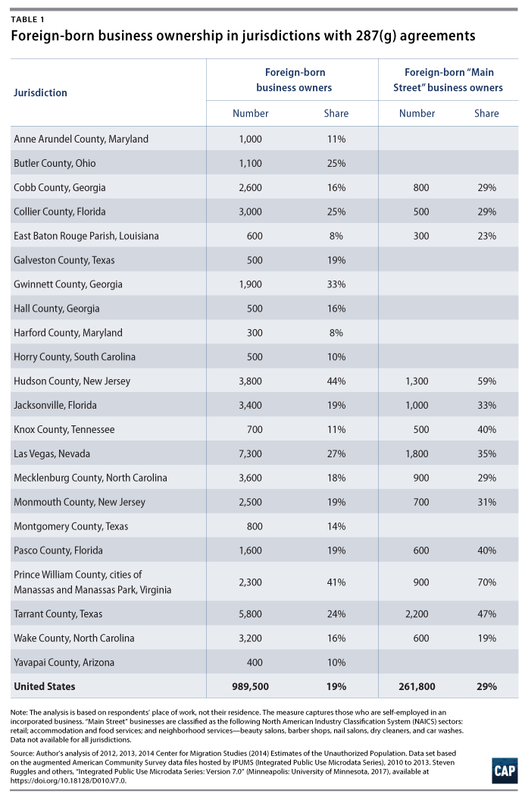 Rates of mixed status families in 287(g) jurisdictions are particularly high in Hall County, Georgia, at 30 percent, and Whitfield County, Georgia, at 26 percent. Collectively, unauthorized immigrants and their families make up 7 percent of the total U.S. population. A ratio can help put these numbers in perspective: Across the United States, 69 out of every 1,000 people live in mixed-status families. For jurisdictions with 287(g) agreements, this value ranges from 10 out of every 1,000 to 213 out of every 1,000 people. In total, more than 1.5 million individuals live in mixed-status families across the 40 jurisdictions described in this report. Beyond longstanding ties to families and the community, additional reasons 287(g) agreements are not smart and potentially disruptive come down to financial strain. In creating hostile environments for immigrants and their families, jurisdictions that pursue 287(g) jeopardize economic gains that come from business ownership, spending power, and tax revenue attributed to foreign-born residents. Immigrants are more likely than those who were born in the United States to own their own business.47 Immigrants represent 17 percent of the labor force but 19 percent of business owners. The Fiscal Policy Institute’s (FPI) recent work has shone a light on immigrants’ even larger role in what David Dyssegaard Kallick of FPI calls “Main Street businesses.”48 Data from 2012 to 2014 indicates that these places—“shops and services that are the backbone of neighborhoods around the country,” including restaurants, grocery stores, dry cleaners, gas stations, and the like—are disproportionately owned by immigrants, at 29 percent. Immigrants make outsized contributions as business owners in many jurisdictions with 287(g) agreements.51 Immigrants own more than one-third of businesses in Hudson County, New Jersey, Prince William County, Virginia, and in Gwinnett County, Georgia. In each of the 13 of the jurisdictions analyzed, immigrants own more than 1,000 businesses that could be threatened by 287(g) agreements. Foreign-born business owners represent more than one-third of the local-serving Main Street businesses in Prince William County, Virginia, Hudson County, New Jersey, Tarrant County, Texas, Knox County, Tennessee, and Las Vegas, Nevada. Another major economic contribution that immigrants make to their communities as well as the United States comes in the form of spending power and tax revenue. Immigrants pay taxes, but they also infuse money into their local economy as they procure goods and services, benefiting all residents regardless of their nativity. Again, as immigrants make the decision to leave a hostile environment, the spending power and tax revenue that they generate also disappears. At the even broader level of all households with a foreign-born adult, the 40 jurisdictions profiled here stand to lose $65.9 billion in spending power. Collectively, immigrant households in these jurisdictions are responsible for $17.3 billion in federal tax revenue and $7.1 billion in state and local tax revenue annually. Jurisdictions with above average share of contributions compared to the United States at large include Hudson County, New Jersey; Prince William County, Virginia; Las Vegas, Nevada; Gwinnett County, Georgia; Whitfield County, Georgia; Cobb County, Georgia; Collier County, Florida; Tarrant County, Texas; and Monmouth County, New Jersey. Under the Trump administration, ICE eliminated the use of prosecutorial discretion, no longer focusing its limited enforcement resources on high-priority individuals.56 With elimination of prosecutorial discretion, ICE has regressed, arresting far more people without criminal convictions while local law enforcement officials take on even greater roles in the federal government’s deportation force. Perhaps the most egregious breach of these standards is the 287(g) program, which goes beyond other immigration enforcement programs by turning local police officers and sheriff’s deputies into ICE personnel. At best, 287(g) agreements intensify federal enforcement efforts and send an adversarial message to the country’s foreign-born residents; at worst they are mechanisms for discrimination that jeopardize large swaths of the communities that participate. 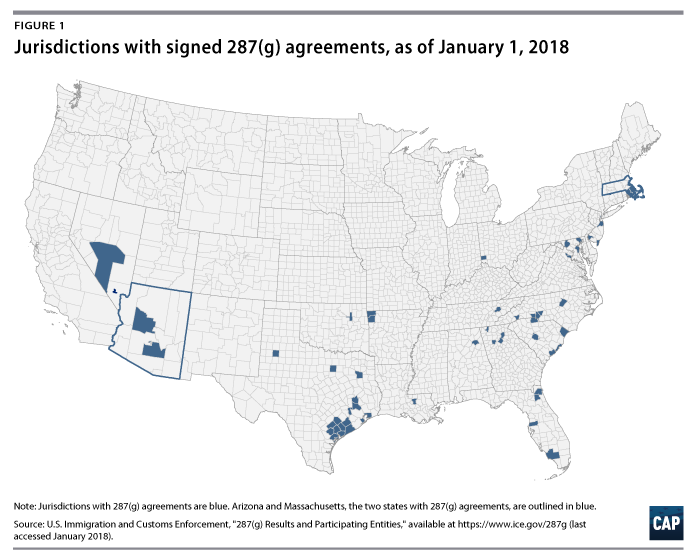 As of January 1, 2018, 59 jurisdictions had 287(g) agreements, a number the Trump administration wants and fully expects to expand. In fact, since completion of this report’s data analysis, an additional 17 jurisdictions announced signed 287(g) agreements, bringing the total to 75, factoring in Hudson County’s decision to terminate its agreement.57 Before community leaders make the decision to pursue or sign a 287(g) agreement, they should take into account this report’s demographic and economic data, which shows there is much at stake if the immigrant community disappears. Nicole Prchal Svajlenka is a senior policy analyst with the Immigration Policy team at the Center for American Progress. She is grateful to the Center for Migration Studies of New York for providing access to its data; Pavel Dramski of New American Economy and David Dyssegaard Kallick of the Fiscal Policy Institute for providing insight into their methodologies; as well as Chris Rickerd of the American Civil Liberties Union for his thoughtful review. She also thanks Tom Jawetz and Philip E. Wolgin of the Center for American Progress for their valuable feedback, the other members of the Immigration Policy team for their input and assistance, and the Art and Editorial team for their work on this report. Two types of ACS data are presented in this report. The first is the 2011-15 pretabulated data, accessed via the U.S. Bureau of the Census’ American FactFinder. This dataset includes population estimates for all 59 jurisdictions with 287(g) agreements. There are several reasons the data are not available for all jurisdictions. Microdata is available in geographies called public use microdata areas (PUMAs), which presents some limitations. First, PUMAs have a population threshold of 100,000, so counties with fewer than 100,000 people will be combined with other counties. Second, places larger than 100,000 people are constructed from multiple PUMAs, but they do not always align perfectly with city or county boundaries. PUMAs are assigned to a city or county if more than half of the population living in the PUMA live in the jurisdiction in question. The PUMAs are then aggregated, and an error rate is created, measuring the share of people who are incorrectly included or excluded. This report presents data for jurisdictions with error rates lower than 15 percent. Given the nature of these PUMA “building blocks,” places that are excluded are typically home to a small foreign-born population. Length of time in the United States reported is the median and corresponds with the survey year for each of the three years. The methodology for mixed status families is derived from the Center for American Progress’ “Keeping Families Together” report.59 The original methodology includes only households of two or more people but includes all immigrants regardless of legal status. This analysis instead counts unauthorized immigrants and anyone who has an unauthorized family member in the same household in this measure. Business ownership—in particular Main Street businesses—is adapted from Fiscal Policy Institute methodology. The analysis is based on place of work instead of respondents’ residence to specifically focus on businesses located in a jurisdiction rather than workers who live there but may own businesses elsewhere. Both place of work and place of residence analyses were run, with results being similar. The measure captures those who are self-employed in an incorporated business. Main Street businesses are classified as the following North American Industry Classification System (NAICS) sectors: retail, accommodation and food services, and neighborhood services (beauty salons, barber shops, nail salons, dry cleaning, and car washes). Tax revenue and spending power is adapted from New American Economy methodology. Foreign-born households include any household with a foreign-born adult in the labor force; unauthorized households include any household with a foreign-born adult without legal status in the labor force. Income quintiles are based on household income. Federal tax rates come from the Congressional Budget Office’s 2016 estimates, and state tax rates come from the Institute on Taxation and Economic Policy. Detailed jurisdictional data for all measures can be found in the data tables in the PDF. Immigration and Customs Enforcement, “287(g) Results and Participating Entities” (Washington: Immigration and Customs Enforcement, 2018), available at https://www.ice.gov/287g.